Assad wanted to meet with Putin to coordinate military action in Syria as Russia takes on a larger role. Joshua Landis, the author of the blog Syria Comment and the director of the Center for Middle East Studies at the University of Oklahoma, says the move was more than just public relations, and a significant effort to bring Assad out of isolation. President Obama and Secretary of State John Kerry still want Assad to step down eventually, but that’s hard as Russia’s ascendance coincides with U.S. policies grinding to a halt in the region. Until Russia stepped up its involvement, Assad’s regime continued to weaken, and the West’s policy was basically wait him out, hoping he’ll offer a compromise. But Landis says the Russians don’t want Assad to collapse, so they can maintain their foothold in the region. In his first known international trip since civil war began in Syria, President Bashar Assad has just returned from a quick visit in Moscow with Russian President Vladimir Putin. 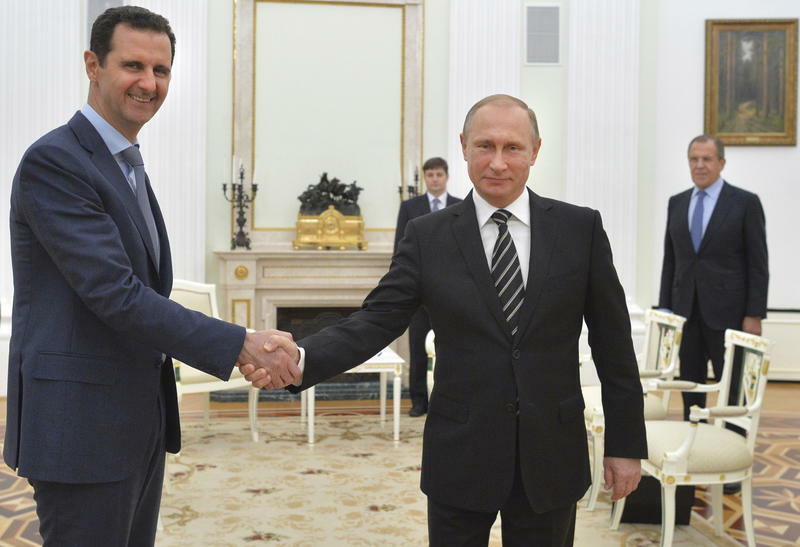 Assad reportedly briefed Putin on Syria's current and future military operations. Assad's trip was kept secret until after Tuesday's meeting — and after the Syrian leader's safe return home. Do Russia And The U.S. Have Any Common Ground In Syria? In Brussels today, NATO defense ministers urged Russia to stop backing Syrian President Bashar Assad. At the same time, Syria’s top general praised the Russians for their airstrikes, saying they have cleared the way for the new ground offensive that Syrian troops have mounted to eliminate terrorists – a term the Syrian government uses to refer to all armed opposition to Assad. Next week President Obama plans to meet with Russian president Vladimir Putin at the United Nations to discuss efforts and support in Syria. Russia has been backing the Syrian administration of Bashar al-Assad since the civil war began more than four years ago – sending planes, tanks and troops to bolster Bashar al-Assad’s government and tenuous hold on power in the troubled country. But the rise of Islamic State militants has created even more questions about who to stand behind in the Middle East.